It isn’t summer until there’s been a blueberry pie on the table, or picnic table. And this easiest ever Open Face Blueberry Pie is simply rustic and summer perfect. Different than a traditional blueberry pie, yet incredibly juicy and delicious. If using a store-bought pastry crust, cook according to package instruction; set aside to cool slightly. If making your own, be sure to prebake the crust. For the filling: Add 1 cup blueberries and 1/2 cup water to a medium-size saucepan; cover and bring to a boil. Meanwhile, whisk together cornstarch and 2 tablespoons water and set aside. When the blueberries have come to a boil, reduce the heat and simmer, stirring, for 3 to 4 minutes or until the blueberries burst and the juices begin to thicken. Add the cornstarch mixture, sugar, lemon juice, and salt. Simmer for a minute or until the mixture becomes thick. Immediately remove from the heat and quickly fold in butter and remaining 3 cups of blueberries. Spoon the blueberries into baked crust and allow to sit at room temperature for at least 2 hours or refrigerate until set. 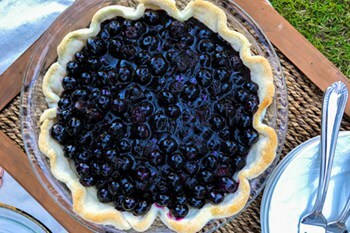 When slicing, the blueberries will remain juicy but will not flow out of the crust. Serve with whipped cream, or vanilla ice cream.